My cold weather comfort zone has expanded 25 degrees since I began cold weather training in early 2008. I used to reach for a jacket when the temperature dropped to the mid 60s. Now it usually has to be in upper 30s before I even wear a long sleeve shirt. Why would anyone walk around in a short sleeve shirt when the temperature is 40 degrees? Why would anyone deliberately take cold showers? This guide will answer all those questions and hopefully inspire you to leave your jacket behind the next time you head outdoors. Shivering My Way To Leanness – I discuss the roots of how and why I began experimenting with cold weather exposure. No Jacket Required – A major status report on how my cold weather training was progressing. Post includes video and notes from Art De Vany’s Evolutionary Fitness seminar. 2009 Polar Bear Plunge – Matthews Beach Seattle – Prior to the event, I took ice cold showers for a week to train. Maybe I Think Too Much But Something Is Wrong – A broader post that attacks conventional wisdom and touches on how humans did not evolve to live in a perfect temperature environment. Urban Hike Seattle – 22.5 Mile Edition – On February 16th 2009, I walked 22.5 miles through the hills of Seattle wearing a short sleeved shirt even though the temperature was in the low 40s. I also did the hike in a fasted state. This hike is evidence of how highly resilient the human body can be without food in a cold environment. The Media Discovers Brown Fat – Two studies came out confirming how cold temperature exposure can activate brown adipose tissue. Triggering the Cold Weather Response For Fat Loss – A commentary on why health professionals will not promote cold weather exposure to help their clients lose body fat. A Chilly 84 Degrees? – Once I adapted to cold weather, I began really noticing just how much people baby themselves with excessive layers of clothes. This photo gave me the opportunity for a mini-rant. My Cold Weather Challenge To You – If you read just one post on this topic, make it this one. It is here that I lay out the case for cold weather training and issue the challenge. Another Reason I No Longer Get Sick – Cold weather exposure and your immune system. No Jacket Required Revisited – Do cold weather training effects carry over from the previous winter? A Guide to the Good Life – Stoic philosophy teaches one to become resilient against known stressors through deliberate action. One example is cold weather exposure. High Intensity Cold Weather Training – Version 1 of a plan that combines the principles of High Intensity Training with cold temperature exposure. You Broke Your Own Metabolism – Without a cold temperature stimulus, the body will become less resilient. Do Cold Showers Lead to Fat Loss or Fat Gain? – My hypothesis on what causes fat gain when some people do cold temperature exposure. 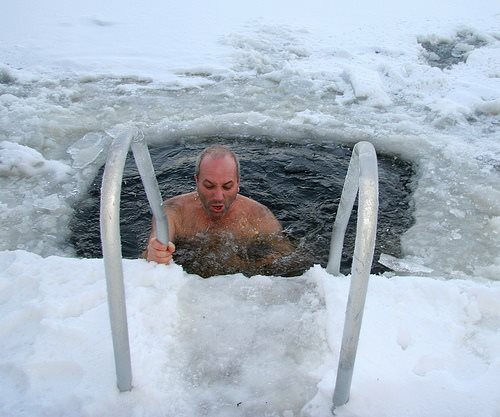 Cold Thermogenesis – 5 Years Later – An overview of my experiences and thoughts on cold exposure over a 5 year period. Visiting the Cryotherapy Chamber – I got super cool super fast. -115 F! Cold Exposure – Not One Size Fits All – When is cold exposure beneficial and when isn’t it. Lean Out While You Sleep – A study demonstrates that adults can regain brown fat with cold exposure. In December 2013, I changed the name of this page from “Cold Weather Training” to “Cold Weather Exposure”.